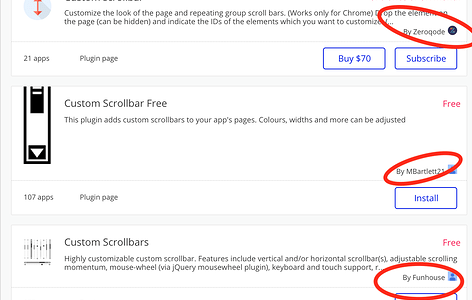 I would like to introduce to you today a new free plugin I’ve just released on the Bubble plugin marketplace, called Customisable Scrollbars. The plugin allows you to change the look and feel of page & repeating group scrollbars, all you need to do is specify the colors in the plugin fields. Enjoy! 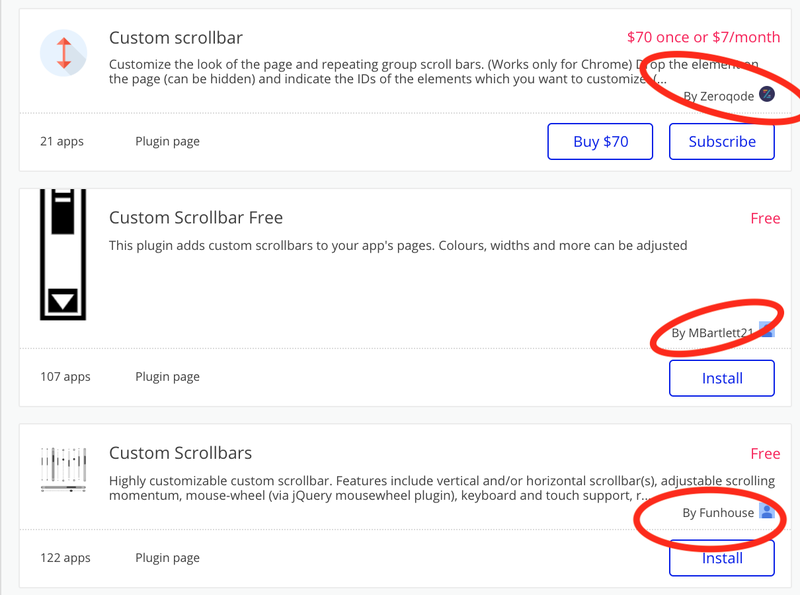 Customisable Scrollbars Plugin page on Bubble. Add Customisable Scrollbars in one click to your app. Bubble lets you build web apps without any code. If you have any suggestions on how to improve the plugin, please feel free to tell me! Thank you @marcusandrews this is something I could really do with. But, I’m still relatively new and I can’t work out how to use it. I’ve installed the plugin. I see no Page HTML code in the Page Inspector. I see no new elements. I see no new options on an RG in the inspector. Any hints or a demo editor & live app? You just need to specify the colours you want in the plugin settings. Thank. I just pasted some hex codes in and it worked perfectly. Thanks for sharing. I can’t seem to figure out how to use it. I’ve added hex codes and tested every possible way. It is not working for me now either. Please replace the API Key bits with your hex codes. Was the reason for it stopping working something that bubble have changed or something you changed? I ask because there seems to be lots of little incidents when people are using Page HTML headers since the rebrand. Yeah, I haven’t really touched anything since release so I think this is the way Bubble is rendering page HTML. Looking into this right now, will update when I find a fix. If you experience any more issues, please email marcusandrews2018@gmail.com or post in this thread. If you do experience any more bugs or have any suggestions email me on: marcusandrews2018@gmail.com. Hey Marcus, Thank you for your time developing this. I can not find the plugin in the bubble plugins directory, did you take it out? I don’t see either the plugin. Unless using a different name? @marcusandrews Amazing plugin!. Just one thing: for some reason Customisable Scrollbars doesn’t work when in put a Repeating group inside a Focus group.